This book came recommended by bloggers I trust completely: Alex and Jess. 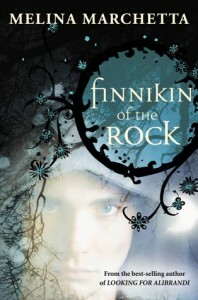 And when I was gushing on Twitter about Witchlanders, Sarah J. Maas said I should definitely read Finnikin so of course I added it to my wish-list! I absolutely, completely LOVED this book! Finnikin is such a boy and I loved all sometimes clueless boyness of him! He really has a sense of purpose and loyalty and the moments between him and his father were heartbreaking. And he's smart, I love smart boys :) He is a natural leader and I didn't once question people following him even though he's still quite young. The worldbuilding was amazing and I really enjoyed slowly getting to know the different cultures! And while the events surrounding the five days of the unspeakable had me a bit confused at first, I eventually figured it out and it was amazing! Also, Evanjalin! Seriously, how can you NOT love her? She's complicated and has a fierce temper but is vulnerable all at the same time. Sometimes I wanted to hug her, sometimes I wanted to slap her, but most of all I wanted to be her friend and have good things happen to her. But really, all the characters seemed to live and breathe right along with me as I was reading this book and it was just amazing! I really did not want to put down this book and if life hadn't gotten in the way I definitely wouldn't have! I got completely sucked into the world Marchetta has created with Finnikin of the Rock and I didn't want to leave! I'm so excited to continue the journey of all these characters I've come to love in Froi of the Exiles, I'm sure it will be just as wonderful! If you're into epic fantasy, you should definitely pick this one up!